The Jump Start Juicer System is a seven-day weight loss program created by Brendan McCarthy, a health and fitness expert and television personality. Initially he designed the plan for his chronically ill father, to prevent and treat heart disease, however he also used it personally to overcome obesity and chronic fatigue. He found that not only did it help people to regain their health but it also promoted dramatic weight loss in a short period of time. McCarthy promises dieters that by following his program, they will not only lose weight, but will also achieve a healthier body, glowing youthful skin, sparkling eyes, better concentration and a lot more energy. On average dieters can expect to lose eight to ten pounds on the program, however some dieters have lost over twenty-five pounds. For the entirety of the seven-day program dieters consume only fresh juices. McCarthy says that this will allow you to cleanse the body effectively and lose weight rapidly. According to him one of the major reasons behind stubborn weight gain is because of an excessive build up of toxins. The body is unable to release the fat because fat helps to protect the tissues of the body from the harmful effects of increased toxins. When the toxins are flushed out of the system the barrier to weight loss is removed and the body is then able to quickly release excess fat. An additional benefit of this program is that juice requires little to no energy expenditure in order to digest and absorb the nutrients. This provides extra energy that can be used for healing chronic health problems. Dieters who are currently eating a lot of fast foods and processed foods are advised to gradually adjust their systems to a healthier diet by increasing the intake of raw fruit and vegetables. Over a two-week period dieters should be consuming at least three pieces of fruit and three portions of green vegetables each day in addition to two fresh juices. At this stage you will be ready to undertake the seven-day program. Food and substances to limit and eliminate: include sugar, sodas, caffeine (tea, cola, coffee), oils, wheat, alcohol, meat, dairy products (cheese, milk, butter) and cigarettes. Fresh fruit and vegetable juice, water. Exercise is generally not recommended because extra energy will be needed by the body to effectively detoxify. If you wish to exercise you are advised to stick with stretching, rebounding, walking or light jogging and avoid intense activities such as heavy weights or high-impact aerobics. Dieters are encouraged to practice yoga as a way to release toxins that are stored in the muscles and to flush the waste from the lymphatic system. 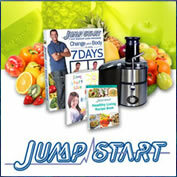 The Jump Start Juicer System retails for $16.95. A powerful electric juicer would also be required. Encourages a high intake of fresh fruit and vegetables (as juice). Produces fast results, which can boost motivation to stick with a long-term weight loss plan. Assists with removal of toxins from the body and may improve chronic health conditions. Not required to count calories. Includes a meal plan, recipes and a seven-day shopping list. Contains inspirational success stories from other dieters. Acknowledges the importance of a positive attitude for successful weight loss. Includes detailed information about the nutritional benefits of each juice. Provides extra recipes and tips on how to eat when the program is completed. Requires elimination of all foods with the exception of fresh juices. Many dieters experience uncomfortable detox symptoms such as headache, fatigue, joint or muscle pain and insomnia. May not be suitable for dieters who are sensitive to carbohydrates as many of the juices are very high in natural sugars. The metabolism may slow down and rebound weight gain is possible when eating is resumed. May be difficult for some dieters to continue with normal daily routines. May be physically or emotionally uncomfortable to be around others who are eating solid foods. The main benefit of this program is that it offers dieters a healthy way to get started on a long-term weight loss plan. The rapid results that generally occur are likely to boost motivation and to reset the appetite in favor of healthier food choices. Rebound weight gain is quite likely due to the metabolism reducing effects of juice fasting as well as the tendency for many dieters to overeat following a period of restrictive dieting. The chance of lasting success with this program will be highly dependent on the dieter’s ability to stick with a healthy diet and exercise plan once the seven days are completed. I bought a jumperstart juicio model CDE-380 but I don,t have the instrucción to opérate. Could you send me the manual please. I am making 7 days juice diet. It is very effective. Thank you. I would have one question. How often can you make 7 days Jump start diet with juices? After you do the first week with juices, then after what time you can repeated again for you want to loose more pounds? I would really appriciate your anwser. What’s the measurements for each serving? ?? my kid is over weight and l want him to cut down.l try sometimes to deny him som foods but he sneaks out and eat things like chips.what must he eat ? l have tried to talk to him .He is 8yrs . Go to Food lovers and get a spanspek. Please write to our support team at jsj@creativenations.com. They will be glad to help you with your problem. I am glad to read your queries here. Please write to our health support team at jsj@creativenations.com. They will be more than glad to assist. Thanks. I started with the 7 day jumpstartjuicer and it has worked wonders for me. when I start I was weighing 90, now im weighing 86 and I want to still loose 11kg. my problem lies after 7 days juicing i seem to gain again. My request to you is that is it possible that u can draw me or send me your receipt or menu that i should follow even after the 7 days jumpstartjuicing. Hi Im on my third day and have lost 5kg just want to know after 7 day complete what juice must I drink I m not sure on the amount of fruits should I eat .and I am about 20 kg over weight so I would like to loose more after my 7 day detox please could you recomend me a diet plan. Congratulations! I am very happy to hear that the program has worked wonders for you. Keep it up! Thank you so much for your kind words about the program and good luck to your father. Great to hear from you and thanks for leaving a comment here. As for the concern of your daughter,the program is more for adults and not suitable for young kids her age. Though, if you want her to go on the program, what you may do is that you may incorporate the juice recipes with her meals. As much as possible you want to get rid of dairy from their diets and serve as much raw vegetables and fresh fruits as possible. With this change in diet, the weight loss will not be as dramatic but slowly it should come off. I hope that this has helped and if you have any other questions do let me know and I will get back to you as soon as possible. I have tried this program and it really changed my life. I highly recommend this program. My father is also into the system. He is on his 4th day and he really likes the results so far. Thank you Brendan for this amazing program.